Just about anyone who takes a trip to the historical city of Kyoto goes home bearing a box of yatsuhashi　（八つ橋）, a small delicate sweet that is flavored with nikki or cinnamon. While I am not from Kyoto, I get a fit of nostalgia for yatsuhashi on occasion. Fortunately they aren't that hard to make at home. Yatsuhashi, which means 'eight bridges', come in two basic forms: nama or 'raw' yatsuhashi which are soft, and yaki yatsuhashi which are hard and cookie like. 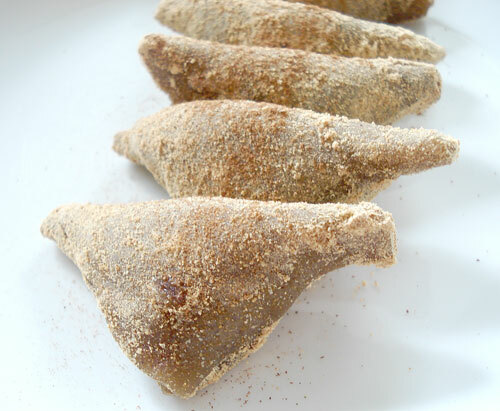 Nama yatsuhashi, pictured below, are soft, thin squares of cinnamon scented mochi (sticky rice) dough, folded into a triangle with a filling of sweet azuki bean paste (_tsubuan_). Really traditional yatushashi calls for nikki sui or cinnamon water, but ground cinnamon is much easier to get a hold of so that's what I've used here. I have also used natural or raw cane sugar for additional flavor. I've given two dough recipes here. One uses mochiko or sweet/glutinous rice flour only. Mochiko or the Chinese equivalent which is usually labeled "glutinous rice flour" seems to be quite widely available at Asian grocery stores and health food stores. Most Japanese recipes for yatsuhashi call for a mixture of medium-grain rice flour (joushinko) and sweet rice flour, but when I used this mixture for mitarashi dango I got a lot of comments and emails that it was hard to get the joushinko. Note that the amount of water is a bit different when you use 100% mochiko vs. a mix of mochiko and joushinko. 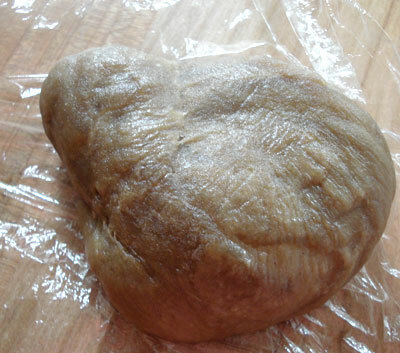 This amount of dough makes about 12 small yatsuhashi, or a batch of baked yatsuhashi. For maximum cinnamon flavor, make sure to use fresh cinnamon powder! 3-4 Tbs. _tsubuan_ or other filling (see notes below for suggestions). You can make your own tsubuan, or buy cans or bags at a Japanese grocery store. Mix the dry ingredients together well with chopsticks or a fork, add the water and mix very well. It will be rather loose and sludgy. Microwave on HIGH for 1 minute. Take out and mix well again - most of the moisture would have been absorbed. Put back in the microwave and cook on HIGH for 1 minute 30 seconds. Take out and mix again. 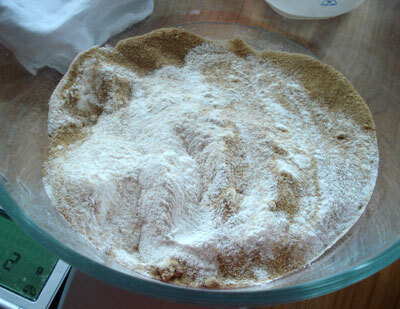 At this stage it will form a rough ball and more or less clear the sides of the bowl. 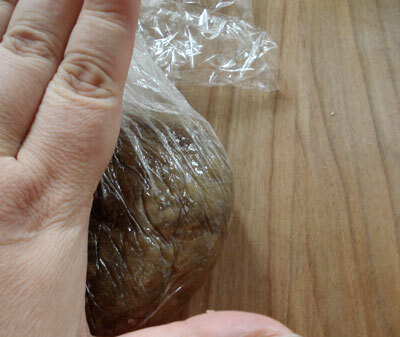 Spread a large piece of heat-proof plastic wrap (like Saran Wrap) on your working surface, and turn the dough out on it. 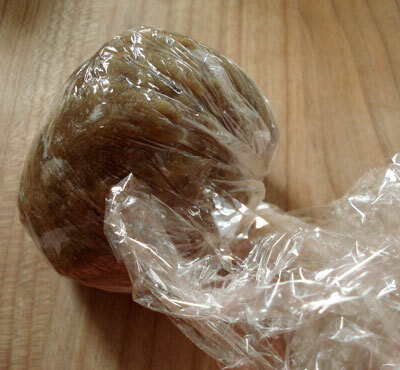 Wrap the dough up in the plastic. 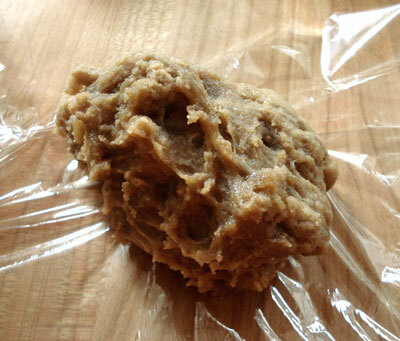 Knead the dough several times, using the plastic wrap as a heat barrier and to prevent sticking between you, the working surface and the dough. 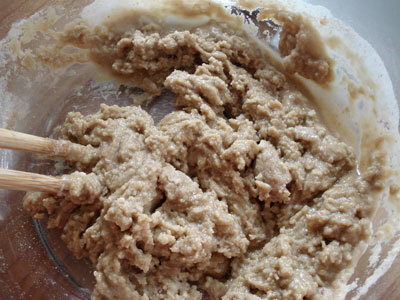 This kneading is very important to ensure the dough is smooth and pliable. You may have to open the plastic wrap and re-shift the dough a few times. Keep kneading until the dough is smooth and shiny. 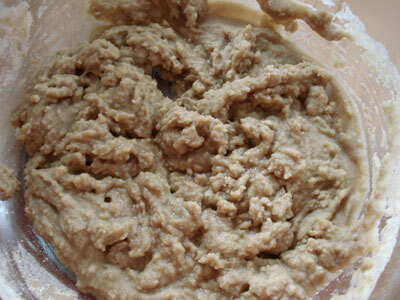 The dough here is almost ready - it just needs a few more kneading turns to make it totally smooth. Mix the 3 Tbs. of kinako and 1 Tbs. 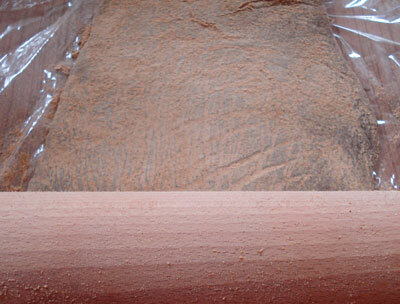 of cinnamon, and use this as the dusting 'flour' to roll out the dough as thinly as possible. It helps to use more plastic wrap to prevent sticking here. If you have trouble getting it thin enough, try dividing the dough and rolling out smaller pieces. Cut the dough into 10 to 12 squares. Wet two sides, fill with about 1/2 tsp. 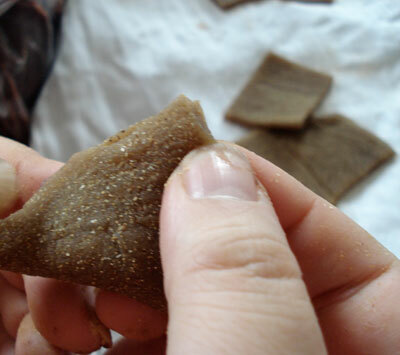 of filling, fold up into a triangle and press hard to seal. I then like to coat them again in the kinako-cinnamon powder mix, and dust on extra cinnamon to serve, but this is optional. Green tea is the perfect accompaniment to these. Nutella - this really fits! If filling the dough doesn't work, you can just spread the filling of your choice on top of a flat piece and pop it in your mouth. 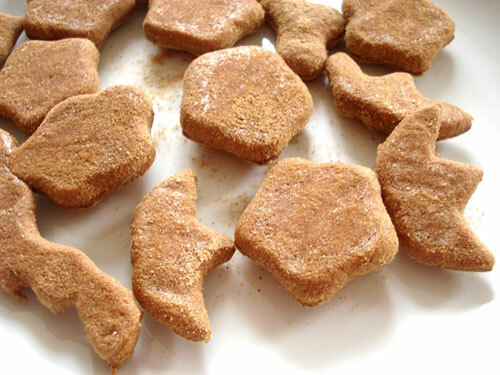 You can use the dough to make little cinnamon flavored cookies that are, of course, gluten and fat free. Just cut the thinly rolled out dough into squares, or fancy shapes with cookie cutters. Bake in a 170°C/335°F oven for 15 minutes, then turn the heat off and leave the cookies in there for an additional 15 minutes. The cookies may or may not puff up, but either way they will be very crispy. 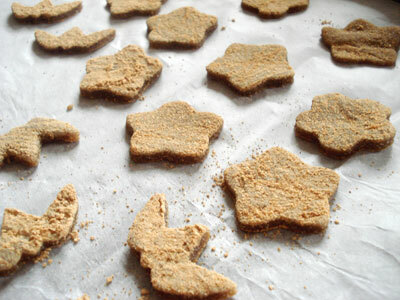 You can optionally sprinkle them with additional cinnamon or cinnamon sugar while still warm. Submitted by maki on 2008-08-20 14:43. Sure, you can cook the dough in a pan, over low-medium heat. You must stir it constantly, and be careful of burning (take the pan off the heat for a bit if it looks like it's going to burn, still stirring). As soon as the dough turns into one rough clump and starts to clear the sides of the pan, it's done! Then you can proceed to the kneading stage. Have fun! Is there a scale you can recommend? I'm looking to buy one, but have yet to find a suitable one, or any information about a good price. I was hoping to spend ~20-30 but would like to know how much you have spent and/or would recommend. I have a Soehnle scale (German maker), sort of like this one, but a bit fancier (the digital display is a separate unit and they talk to each other wirelessly). I have to say though that it was an impulse buy, because I fell in love with the design! The less expensive Soehnle models in the $30 range should be fine. I've had mine for a bo ut 4 years now and it works with no problems at all - I haven't even had to change the batteries yet. Before that though I had a Terraillon scale, and that worked fine too. You want to look for one that has an easy to read display, can do TARE (zero out the weight of the container so you don't have to do maths in your head as you weigh things), maybe a switch that goes from metric to imperial measurements and back, and is easy to clean. When I was living in Japan there was a soft, chocolate filled cinnamon version that was AMAZING, but so hard to find. These sound so much like that, and the nutella is a brilliant idea. For the nama yatsuhashi (filled soft ones), about 50 calories per piece. For the cookies (I got about 60 little cookies from the dough) about 10 calories p.p. Are these yatsuhashi the sweets that you can get at the main Kyoto train station? I always get a box of triangle sweets, they are either light pink in color or macha-green, and stuffed with sweet bean paste. They are more flat though, than what you have pictured here. A Japanese friend of mine just came back from Japan and I told her not to bother coming back unless she brought some Yatuhashi with her! They were great but I had no idea that they were this easy to make. Now I know exactly what to make for a friends housewarming. I may try a few of these with ganache/truffle centers. I'll let you know how they turn out. I'll also be winging it in the measurements department, as I haven't got a scale, so I'm certain it will be an interesting endeavor. Can't believe these are so easy to make. When I lived in Hyogo I used to go get them from a store in Arashiyama that was just beautiful (they made their own sakuramochi too, which was how I found the store in the first place - good sakuramochi is worth travelling for). Now, I always buy them from Kansai Airport, and it really annoys me when all I can get are the chocolate dipped yaki yatsuhashi, as I think they are so much better plain. I'm going to try making my own now (I think if you cut the dough into fan shapes, they'd make a great wafer for ice cream sundaes). I'll be sure to try out this recipe, since I'm missing Kyoto and Japanese food so much! Wow...that dough has to be stickiest thing EVER! However, the Yatsuhashi smell and look fabulous. Can't wait to get stuck in later. 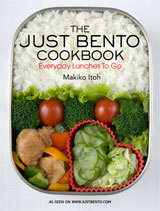 Thank you ever so much, Maki - your recipes are always brilliant: easy to follow and with great results. it is indeed very sticky...dusting with lots of kinako + cinnamon helps though! Is there an alternative to using a micro-wave? love this recipes do you have another one like this ( another flavor) or other Japanese dessert????? I can't wait to try them. Cinnamon is one of my favourite spices, and I love making sweet things. They really look good. Will I be able to make the cookie version though? It says to turn the oven off and leaave them in, but we have an aga. Oh yum! I miss these and am SO happy to hear that they are so easy to make! I'll definitely be making some soon. I love the idea of filling them with nutella. You are totally speaking my language. Great recipe!!! Great job! this really tastes like how i got it from osaka/kyoto!!! Thanks for the recipe!!! Thank you. Thank you. Thank you for posting this recipe. I loved these sweets when I lived in Japan! Japantown in California used to carry them on occasion, but not anymore. Now I can make them myself. Oh, I so appreciate it!!! Could you explain how to make the dough not using a microwave? I have tried a few times myself but something is not working.. I haven't tried it, but for each microwave cycle use a fairly small, shallow pan, and stir the dough constantly until it forms a film in the pan, let cool then knead. 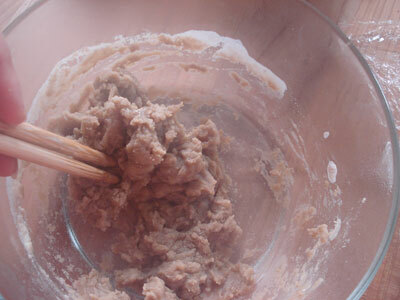 That is how gyuuhi (the base dough for many Japanese sweets) is made traditionally. If you double the amount you're making, do you also have to double the microwave cooking times? ^^ From my experiences with my ornery microwave, it does better heating all in one go than just in increments. Thanks! I haven't tried it with double the ingredients, so I'd recommend microwaving the same time, then checking, and then microwaving some more if it's not enough, etc. I'm a 14-year-old girl from Singapore, and unfortunately I have no idea where I get kinako. Could something else be substituted, perhaps? Kinako is just roasted soy beans that are ground up, so you could try roasting your own soy beans (from raw, over low heat, stirring frequently, in a heavy metal frying pan or an old wok until they are brown and smell toasty) and grinding them up in a mortar and pestle, then sifting it. It is hard work, but freshly made kinako is really delicious! Fantastic - thank you so much for this great post. I've been trying to find out how to get hold of some of these ever since I got back from a vacation in Japan 3 years ago, but no-one ships them and of course they aren't available in Zurich! Your step by step pictures show how simple they are to make, I can't wait to get my hands on the ingredients and have a go myself. You've made my weekend! Thank you so much for posting this recipe! I've been hunting for a recipe for these for a while now, to the point where I've bought several cookbooks in Japanese to slowly translate (my kanji knowledge is limited.) I had no idea these were so easy to make, too. I can't wait to give them a go now. I used to stock up on boxes at Shin Osaka Sta,whenever I went to Osaka. I never would have thought to try to *make* them. I'm so jonesing for some,I have to try this recipe ,even if it comes out disasterous. I got all the ingredients from Mitsuwa today ! I'm going to try this over the weekend .I will let you know how they turn out . I'm worried my filling will be wrong .I got canned azuki,and this azuki paste with chunks of bean in it.Endo Seian its called. I had all the ingredients last week,but then I found your recipe for tsuba an.So I went back to mitsuwa yesterday,and got everything to make tsuba an from scratch. I made them tonight ! I tried it with both store bought tsuba an,and the one one I made. Its amazing with the little bit of salt in it,but I like it a wee bit sweeter,so I dusted mine with cinnamon sugar. I'm sso happy,I could bust. And I just read about a mochi dessert from Mie with fresh inchgo inside. I will be trying that next. Really interesting finding though,one of my cats loves tsuba an. I have to give him a tiny dish while cooking or there's a problem . Wow! Just wow. I was googling Yatsuhashi (I'm an addict) because I needed to explain it to a foreigner friend. 'How are they made', I asked myself, and 'might there be any explanation or recipe'. And I ended up on you site again, like so many times when I need to explain something to somebody. You are a genius. Thank you! I was wondering if you know what changes to the recipe are needed if you wish to make the ones that have a black sesame dough on the outside? I love these! I reduced the cinnamon by half and used the stove top method. I liked them 'raw' but enjoyed them more baked. I used icing sugar with kinako instead of more cinnamon when rolling the dough and that worked very well. As I have a gas stove I had to turn the cookies half way through baking. When they were cool I topped the cookies with melted chocolate. Delicious! This looks great! I think I am going to try baked Yatsuhashi and cut them with my onigiri-mold - I have an omusubi-box with ever so little space on the side for a dessert, and I think they would be just wonderful! Thank you very much! I am just wondering how you managed to roll the dough. The second I lift the rolling pin up the dough goes back to its original shape. I have tried stretching it like pizza dough, pounding it, forcing a metal plate down onto it but it always goes back to its original shape. The mochi is easier to roll when it is hot. The other thing is to make sure your mochi is soft enough. Maybe add a bit more water to the dough before cooking it. Made these today. Lovely. They brought back memories of my magical time in Kyoto. I don't have a microwave so I steamed the mochi, and I also discovered that a Silpat makes kneading the mochi sooooo much easier than plastic wrap. Any thoughts on why sometimes they puff ? I'd like mine to be a bit more flat and wafer like for chanoyu...maybe weighted by another cookie sheet while baking?